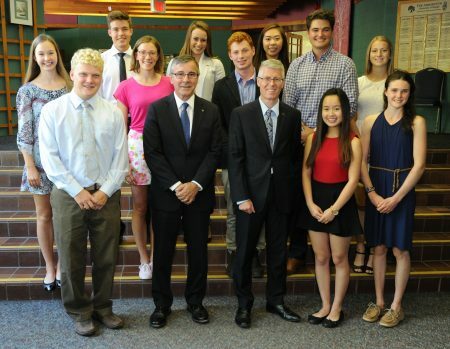 The University of Guelph awarded its top annual scholarships to incoming students Sept. 2 at the Arboretum Centre. The 2016 President’s and Chancellors’ Scholarships were awarded Sept. 2. The President’s Scholarships are awarded to first-year students based on high school achievements, leadership abilities and citizenship activities. This year’s recipients are Katherine Bailey, Andrew Shepherd, Hannah Woodhouse, Megan Sullivan, Amber Ziebarth, Catherine Dang and Mackenzie Cameron. Noah Muntwyler was awarded the David Mirvish Chancellor’s Scholarship, named for U of G chancellor David Mirvish and recognizing student leadership in arts, culture and community. Sean Mitchell won the University of Guelph Chancellors’ scholarship, which recognizes exemplary student leaders interested in international relations and development. Jared Schenkels and Peyton Tam each received a Lincoln Alexander Chancellor’s Scholarship. This award, named for former longtime chancellor Lincoln Alexander, recognizes top students who belong to an ethnic minority and who have made significant community contributions. The 2016 Chancellors’ and President’s Scholarships are worth $40,000 each over four years and include an opportunity for a summer research assistantship worth an additional $8,000. Recipients are teamed with a faculty mentor in their academic discipline. The scholarship program has recognized about 350 students since the first President’s Scholarships were presented in 1987. The awards are funded mostly through donations from alumni, friends, faculty and staff. Recipient bios are presented below. Learn more about the history of the University of Guelph’s undergraduate scholarship program, and about Chancellors’ and President’s Scholarships application details. Katherine Bailey (Biomedical Science) is a recognized leader in school and community, and a passionate award-winning musician. She volunteered to help build schools in Kenya, and hopes to become a pediatrician in a developing country. She won the Oakville Optimist Club award for running a school breakfast program and discussed the program at a regional nutrition conference. She also volunteers with the Oakville Trafalgar Memorial Hospital. Mentor: Prof. Jennifer McWhirter, Population Medicine. Andrew Shepherd (Biological Engineering, Co-op) created and led activities for young students in a university science camp, served on the student activities executive council and organized charitable events including fundraisers for underprivileged families. He plans to join U of G’s cross-country and track and field teams. He represented his high school at the Ontario Student Leadership Conference. He wants to ensure a healthy environment, including clean energy. Mentor: Prof. John Donald, Engineering. Hannah Woodhouse (Biomedical Science) is a musician and athlete. She served on school and athletic councils. She has won national running championships and represented Canada in world cross-country championships in China, and plans to join the Gryphon running team. She volunteered with school groups such as the Born to Read program and with community organizations, including 4-H and the Heart and Stroke Foundation. Mentor: Prof. Glen Pyle, Biomedical Sciences. Megan Sullivan (Biomedical Science) is a top Ontario soccer player. An excellent student, she volunteered with breakfast and hospital programs, supported younger students and completed leadership training with the City of Burlington. She chaired a school mental health action team whose “exam candies” project has become an annual exam stress buster, and served at the local school board as a school senate representative. Mentor: Prof. Gord Kirby, Biomedical Sciences. Amber Ziebarth (Biological Science) is an award-winning writer, a gifted musician and an elite dancer who hopes to become a physiotherapist. She has served on student council and a school mental health club, ran a leadership conference for younger students and organized city recreation activities for children. She was Minister of Leadership Development for her school district leadership organization, and an international delegate to a Rotary youth leadership conference. Mentor: Prof. John Dawson, Molecular and Cellular Biology. Catherine Dang (Biological Engineering, Co-op) attended numerous provincial science conferences, including the Miss Infinity science conference at the University of Guelph, and served as president of DECA, Canada’s largest youth business organization. A talented writer and musician, she took part in student government, edited the school yearbook, and helped teach music and Vietnamese. Mentor: Prof. Karen Gordon, Engineering. Mackenzie Cameron (Mathematical Science) is an endurance athlete and outstanding scholar who received numerous academic, merit and sports awards. She aims to serve as a role model for young girls. A member of student senate and writer of her high school’s online newsletter, she volunteered as a student mentor and with Relay for Life. She coached young cross-country and track and field runners and attended a national student leadership conference. Mentor: Prof. Matthew Demers, Mathematics and Statistics. Noah Muntwyler (Animal Biology) is a top student, an artist and a classical musician. He is also a competitive equestrian rider with a love for animals. He led his high school music council, wrote a column for the school newspaper, organized a Model United Nations conference, and led fundraising efforts for people affected by the Nepal earthquake and the Philippines typhoon. Mentor: Prof. Joanne Hewson, Clinical Studies. Sean Mitchell (Environmental Engineering, Co-op) played violin as a preteen for church and seniors’ groups. He led other musicians and fundraised for building overseas schools. As president of the Brussels Leo Club, he helped run food drives for the local food bank and raise funds for community physical activity. He was also a member of student government. Mentor: Prof. Andrea Bradford, Engineering. Jared Schenkels (Environmental Sciences, Co-op) led numerous projects, including multi-day treks spent mountaineering in the Austrian Alps and canoeing in France. He directed a live school TV program and led workshops on climate change and sustainable agriculture. He has volunteered with a local fire department and the Canadian Ski Patrol. Mentor: Prof. Neil Rooney, Environmental Sciences. Peyton Tam (Animal Biology) intends to pursue veterinary studies and provide animal care services for underprivileged people and people with disabilities. She took part in school athletics and music, and served on student council, where she organized fundraising events for children with hearing loss. She was chosen to present a leadership program at local middle schools. She has mentored at-risk kids and tutored children from refugee families. Mentor: Jeff Wichtel, dean, Ontario Veterinary College.